Dubai, UAE, September 26, 2016: ARTASA has designed and produced all the exclusive artworks displayed in the public areas of the new Marriott Courtyard hotel in Riyadh (recently opened), a property of AL HOKAIR REAL ESTATE. Already well established in the GCC, ARTASA has been selected by AL HOKAIR REAL ESTATE, a leading group of Saudi, to provide all the art pieces of the lobby, lounge, restaurant and business center of its new luxury hotel property located at Mussa Bin Nasser street in Riyadh. For this project, ARTASA has worked in collaboration with artists from North America, Europe, Asia and Saudi, fulfilling the particular requirements of Marriott and the interior designer of the project: Echo Architecture London. 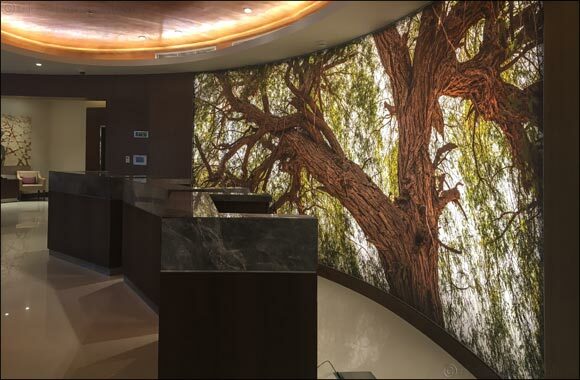 One of the most impressive art pieces is the huge backlit photo visible at the lobby reception of the hotel. It looks like a large window open onto a Ghaf tree, a local tree of Saudi Arabia. Riadh SIFAOUI, co-Founder and Art Director of ARTASA, has produced this image on order using the particular multi-row panoramic technique of shooting. Made of 20 photos stitched all together, the backlit image is offering an amazing sharpened and detailed view onto the tree, from corner to corner. This impressive rendering is emphasized by the angle of shooting: Riadh SIFAOUI has placed his camera under the tree. As a result, the backlit image gives the amazing feeling of being at the shade of it. The high quality of the digital print made on one roll of almost 7 meters long and 3 meters high (printed in France) and the backlight installation are accentuating this impressive rendering. In addition to it, for the handmade paintings, the digital arts on glass and the other art pieces and decorative items displayed in the public areas of the hotel, ARTASA has collaborated with established artists coming from all over the world. For instance, ARTASA has involved Paul VILLINSKY, a famous visual artist from New York, for the wall installation located at the main entrance of the hotel. The artist has personally installed onsite a flow of over 200 butterflies. Cut from recycle aluminum cans and painted with the colors of the lobby, the butterflies are installed on wall of 7,6 meters long and 4 meters high and show several shapes and sizes. ARTASA has also worked with an experienced French artist, Jean-Paul BOYER, specialized in modular sculptures. His sculptures are made of many elements assembled with a central axis around which they can freely move. His idea is to keep alive the interest of the visitors by showing many different shapes with each of his sculptures. Mrs. Marie-Noelle DUREGNE, Co-founder and CEO of ARTASA stated: “We are proud of all the art pieces and decorative items we've provided for the Marriott Courtyard hotel in Riyadh. Each of them has been designed and produced on order, involving artists from America, Europe, Asia and also from Saudi! That's why I can say that we've contributed to give a signature to the interior design of the public areas of this luxury hotel'. Marie-Noelle added: “Of course, we are also proud to count the Marriott Courtyard Riyadh in our list of references and FAWAZ A. AL HOKAIR REAL ESTATE Co., one of the largest real estate company of Saudi Arabia, as one of our client”.